The really great news is that my long awaited soontobemillionselling book ‘The Cat’s Travelogue’ is going to be available very soon any and everywhere and that means you can buy a book either in paper or ebook form in the very near future. Speaking of my long awaited soontobemillionselling book ‘The Cat’s Travelogue,’ a wonder of a little book written by a Cat, one of the places I visited was Vietnam though because of signs such as the one below and other divine bureaucratic blunders the chapter on Vietnam was ‘sponsored’ by the Socialist Republic of Vietnam and then removed by me from the printed edition. Did you know that the Socialist Republic of Vietnam’s motto is “Independence – Freedom – Happiness” – if you ever did! It’s my fervent hope that you enjoy my latest book ‘The Cat’s Travelogue’ more than the menu item below and that you tell all of your friends to buy at least one copy and make this clever Cat very happy. 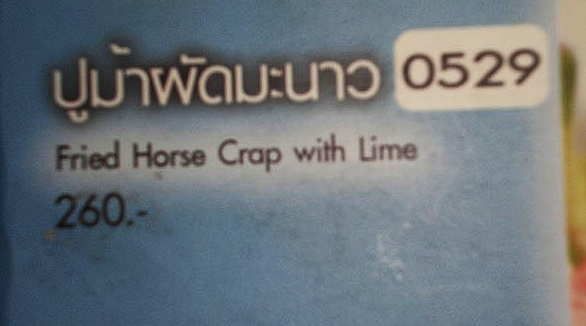 One thought that went through my furry head when I was sitting outside the restaurant in the heat and pollution of Ho Chi Minh City reading the menu below was this “what was the ‘Lime'” if you see what I mean, “do the Vietnamese serve a Citrus fruit with their Fried Horse Crap or is the ‘Lime’ on the menu the white powdery stuff that they add to cement, gardens and the graves of adulterers in days gone by?” Sadly to this day I don’t know because I didn’t order this menu item – what do you think I am stupid? Don’t forget that like ‘Getting Out Excerpts from A Cat’s Diary’ ‘The Cat’s Travelogue’ will make a wonderful Christmas present.